The world may soon be able to buy one of the Far North's most controversial yet revolutionary inventions. The Lutec 1000 free energy machine has resurfaced after six years of steering clear of the public spotlight, having been granted patents in at least 60 countries around the world, including the US, China and India. 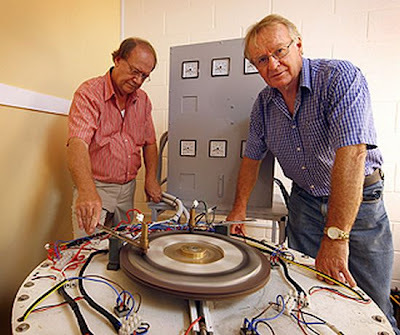 Engineers John Christie and Lou Brits, who have endured intense criticism after they first unveiled their invention in 2001, are now preparing to construct a prototype of their revolutionary power device they hope to market within the next two years. The dynamic duo said they felt somewhat vindicated they had been able to land patents for their device and have had the Lutec verified by an independent engineer. "When we first kicked off, there was a huge fuss about it and people said we’d never get patents for it," Mr Christie said. "They said it would never work, so we couldn’t get patents, so it’s a good thing to see now." The generator works as an energy amplifier, generating up to 10 times the amount of electricity it consumes. The Lutec draws its power from a bank of batteries, with the motor turning due to powerful permanent magnets at its core being attracted and then repulsed from steel cores of fixed coils. It does not work via perpetual motion, rather it relies on natural magnetic forces and a pulsed electrical input. The results of the generator were verified by independent engineers from SGS Australia following a test earlier this year, which confirmed the energy output from the generator was indeed greater than its input. Mr Christie said he and Mr Brits were currently working on a production prototype to suit the domestic market, which they hoped to produce locally. "If we go with our plan now, there is no reason why it couldn’t be available in Australia in two years," he said. The engineers’ invention has drawn the ire of many people over the years, including the Australian Sceptics Society. Mr Christie said it had been a roller-coaster ride since they debuted their invention, involving occasional death threats and rumours of their untimely demise. "Last year I was apparently killed in a hotel in north Perth somewhere, according to the internet," Mr Christie said. "I was really quite surprised."